Expected budget cuts could mean less safety in the food Canadians eat, the union representing food inspectors said Monday. Canada's food inspectors say they fear budget cuts could endanger food safety in Canada. Bob Kingston, the head of the Agriculture Union, raised the issue Monday morning, along with the daughter of a woman who died of listeriosis in 2008. 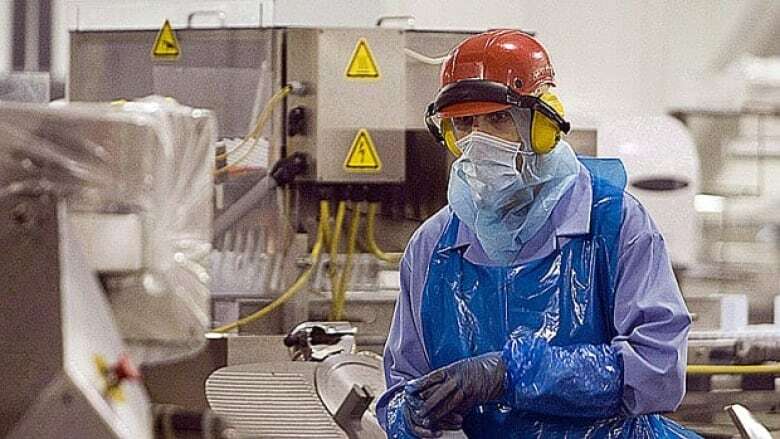 An outbreak of the bacteria at a Maple Leaf Food plant in 2008 killed 23 people. Kingston says Canadian Food Inspection Agency documents tabled in the House of Commons last fall show the federal government plans to eliminate food safety funding that was put in place after the 2008 listeriosis crisis. The government added money for an additional 170 inspectors for processed meat after the crisis, but the funding was temporary and is due to end in March. "In addition, it appears that the government also plans to cut back on the frequency with which processed meat establishments are currently inspected," he said. The Report on Plans and Priorities for CFIA show the food safety program budget dropping from $351.5 million in 2011-12 to $331.9 million in 2012-13, and to $330.4 million in 2013-14. The number of full-time equivalent staff in the program will drop from 3,177 in 2011-12 to 2,970 in 2012-13, with no further decrease set out for the following year. The food safety program takes up almost half of CFIA's budget, but that could change. Every department in government is facing cuts as the Conservatives try to bring the federal budget back into balance by 2015. A spokeswoman for Agriculture Minister Gerry Ritz wouldn't say whether the government plans to extend the funding but pointed out the money was only ever available for a limited time. In a statement, Ritz said the cuts wouldn't affect food safety but he didn't explain why not. "Canadian families can be assured that the safety of our food supply will not be affected as federal departments and agencies look for ways to be more efficient and more financially prudent with taxpayers' dollars," he said. "The Government of Canada has and will continue to make the safety and security of Canadians a top priority." The budget crunch could be worse, with every federal department having to find cuts of five or 10 per cent. Those cuts will make CFIA "smaller, weaker, less able to ensure compliance with safety requirements than it was even before the listeriosis crisis three and a half years ago," Kingston said. "Food safety costs money, but less safety can cost a lot more, both in terms of money and human suffering." The union is starting a campaign called Food Safety First, asking consumers to put pressure on companies like Maple Leaf and on the government to pay for more food inspections. Karen Clark, whose mother died of listeriosis after eating tainted meat in 2008, said she hopes the food industry will urge the government to extend the funding. "We can’t let this happen," she said. "This scares me, quite honestly, to see the federal government’s attitude. It seems as if they think Canadians have forgotten about the listeriosis outbreak and all the people it affected. That they can reduce these programs and inspectors and no one will notice or care. "Politicians here in Ottawa like to say that food safety is their No. 1 priority. With these plans, it doesn’t seem that way to me."